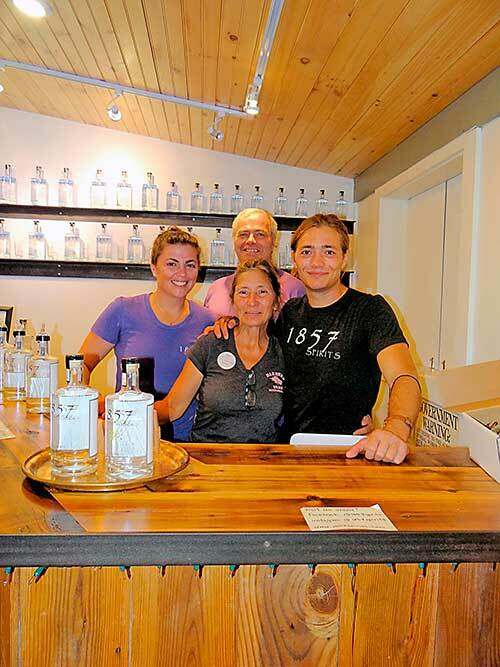 Sixth generation farmer Elias Barber isn’t going to just stand around and let the potatoes grow under his feet; he’s going to put those potatoes to work in his recently established distillery in the Schoharie Valley, near Middleburgh, NY. Barber credits his education at Cornell for his grasp of knowledge in pursuing his venture with producing 1857 Potato Vodka, named for the year the Barbers first came to the property and began farming there. His focus was on agricultural sciences. But, what he was learning in the classroom seemed a lot like what he already knew, due to having hands-on experience growing up on the farm. It took three years of construction and planning and obtaining licensing, before the facility was up and running and they were able to sell their product. Barber said the distillation process alone presented an incredible amount of time to install and work out. Production began in 30-gallon batches. Driscoll reports that about 2400 lbs. of potatoes, which calculates to be roughly 42 bushels, are washed, chopped and cooked at the distillery. An industrial sized chopper is used for chopping the potatoes after they are washed. For the most part all the equipment is new. Once the potatoes are chopped and ground up, the mash is pumped into the cooking kettle. From there it is pumped into a fermenter where a specific strain of yeast is added to the mixture and it ferments for a week. Temperatures in the fermenter vary. The pot still is heated to about 190 degrees and the alcohol is vaporized, traveling up a column, leaving the water and other residue behind. Barber says vodka needs to be distilled at over 190 proof or higher. That can be achieved through the use of the 30-foot column still. Barber admits there is an allure to his occupation not found in many other occupations. The resulting product currently creates three different styles of potato vodka. For the Signature and the Classic, Barber’s use ultra-high starch content – white potatoes. “That’s what we’re after.” This is mostly found in the variety of potato. “The variety we use produces a lot and stores very well, as well as having the starches and sugar that I want,” said Barber. Currently, Barber’s have six acres of potatoes growing for next year’s processing.